Easter is one of the important dates during the first week of April or late March. This event is a great opportunity to switch off from routine and hard work and at the same time, it’s an ideal opportunity to take advantage of the excellent weather in Malaga and longer, sunny days. We decided to include some fantastic tourist routes and ideas to make the most of your Easter holiday. The first destination we propose is Andalucía to intensely experience this religious event and to enjoy the good weather and the famous tapas of Malaga. Also, if you visit the centre of Malaga during Easter, you'll enjoy celebrations that have been declared of tourist interest. These celebrations have centuries of history and a great artistic wealth in the Easter processions. Literally hundreds of Brotherhoods pass the figure of Jesus and the Virgin, as well as other scenes of the passion and resurrection of Christ meanwhile large amounts of tourists and devotees crowd the streets. Easter (Holy Week) in Malaga is the perfect opportunity to discover this religious tradition. During these days, brotherhoods continuously display their sacred representations along the streets in the popular processions. During Holy Week in Malaga you will find colourful streets and aroma of incense and a large number of people who follow this celebration which one of the most important events in Andalusia. If you want to enjoy this event and at the same time find a relaxing destination, where you can get away from everything we recommend looking for accommodation near the old town. It is the perfect location to enjoy the festive atmosphere of the city but without stress, and you have the opportunity to explore every corner of Malaga and the province. How to get to the city centre to see the Easter Processions? If you want to visit the centre of Malaga during the Easter Week it is advisable to use the public transport. Remember that if you missed the Holy Week in Malaga in 2019, you can still plan to visit next year 2020. 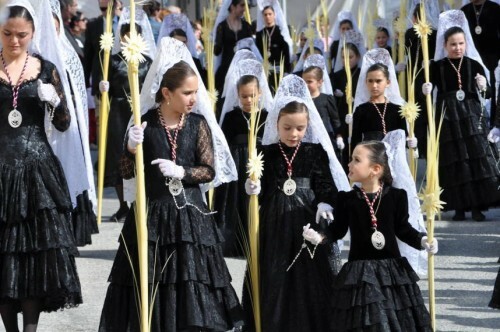 Check the updated list of Malaga Easter processions in 2019, there you will find transport schedules for visiting the processions by train and the timetables of all the processions in Malaga this year. Many people wonder every year about the weather forecast for Easter in Malaga. Light rain is very common some of the days, but we can't forecast much in advance so we are not able yet to know it will be cloudy or sunny in Easter. Looks like the weather will be partly cloudy and with cold, light rain could happen some days until the Sunday but nothing to worry. Monday, Tuesday and Wednesday will be sunny and temperatures will rise. When does Easter start in 2019? The date of Easter is variable and may change from one year to another and is usually not celebrated before March 22 or after April 25, since it is associated with an astronomical phenomenon which is related to the convening of Constantine the Great Council of Nicea; the purpose of this was the discussion about the divine origin of Jesus and among other things it was decided that Easter would be celebrated on the first Sunday after the first full moon of spring. Easter in Malaga in 2019 is celebrated between 14th of April and 21st of April. 18 and 19 in April are Maundy ¨Thursday and Holy Friday, being the Friday a national bank day. 21 in April is Easter Sunday and a festivity day. 22 in April is Easter Monday. While most people prefer to enjoy this event for free, there's always someone who for health reasons or convenience rather watches the Easter processions sitting…in that case and if you prefer to see it live instead of from home can reserve a chair or private seat in Malaga frontline to watch the processions. We should not forget the so-called 'Tribuna de los Pobres' (Tribune of the Poor) in Calle Carreteria where people can sit for free to see the procession. The chairs and private seats are traditionally one of the methods of financing the various guilds and the price varies depending on position and seat row. The price of a subscription for a chair during Holy Week is approximately 60 euros. The price for private seats which includes 6 chairs is around 500 euros. Where to hire a chair or group of private seats? Monday to Thursday from 10 am to 2 pm and from 5 pm to 7.30 pm. Saturdays from 10.30am to 1.30 pm. You can also rent balconies to watch the Easter Processions from a house in the centre of Malaga ... in these cases, the price soars. If you want to know all the routes of the Easter Processions in Malaga we recommend adding this page to favourites. Here or in our blog we will update the information every year well in advance so you won´t miss it. The route of the procession includes certain streets through which passes each and every procession; special mention receives the so-called 'Tribune of the Poor' located in Calle Carreteria, given name for being a stairway where traditionally sit for free on the steps people who could not afford to pay a seat and which now enjoys considerable popularity. The official tour begins in the Houses of the Guilds or churches and along 800 meters runs along the Alameda Principal, Calle Larios and part of Calle Granada. The itineraries can vary from year to year; you can find them for free in stores and tourist offices of Malaga. As far as the history of Holy Week is known, it goes back to the processions that carried out the Greek people with carriages, images and music with the purpose of worshiping their gods; the Catholic Church took these events in addition to the influence of the Roman Empire and its military marches giving place to the so-called processions with the symbol of the cross instead of the Roman standard. During the early Christian processions were transported the remains of martyrs. The origin of the guilds was in the group of people in charge of taking care of the remains of martyrs in their sanctuaries during the centuries V and VI; these guilds began to gain weight and importance from the eighth century and emerged by those founded by ethnic origin or trade union from the twelfth century. In the early seventeenth century is set the use of a mask for all those involved in penance remaining anonymous. Easter as celebrated in Spain, takes a single nuance given by the Catholic influence where is allowed the worship of images, possibly under the influence of Roman polytheism; these representations were introduced by the different brotherhoods from the seventeenth century. The first processions in Spain had penitents flagellate their backs to find salvation through punishment, a practice that has disappeared but can still be found in some towns in Spain. Why is special Easter in Malaga? The first parades day, all of them take special care when passing beside the 'Tribune of the Poors' (Tribuna de los Pobres), one of the most popular spots along the parades route next to Carreteria street. This day is for the parade of the figure of Jesus the Captive, the longest parade of the Holy Week. Featuring the presence of people who walk behind the throne in penance for some fullfilled wishes by the image which they venerate, those people are called 'The Promises' (Las Promesas). 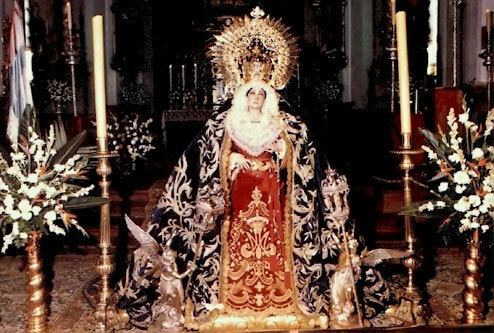 Virgen de las Penas, a parade of a throne and a religious figure with a mantle of flowers. The mantle of flowers is made by the gardeners of Malaga city. It is common by the men who carry the throne on their backs to pick it up higher and move it according the music rhythm. During the Holy Week is quite popular the Wednesday, when they release a prisoner. This act dates back to the 18th century and its origin is due to the year in which the parade was suspended but the prisoners decided to escape and make the parade by theirselves. They later returned to their cells, this caused the king to decide releasing one prisoner every year, an act that still taking place since then. The Thursday is the day for the Parade of Legionaries. They land in the port of Malaga and are part of a procession though the streets of the city. This is the day for the official townhall brotherhood and the religious figure called Virgen de los Dolores. The lights of the city fade off as the throne passes by. This day is the Resurrection parade. You can also have a good day in Malaga by visiting any of the monuments of the city and eating typical food around the place or at the promenade next to the beach. We will start slowly and if we forget a date and you want to participate, please post your suggerences in our Malaga events forum.